Section I - Minerals: 01: The earth, 02: Minerals and mineralogy, 03: Elements of crystal chemistry, 04: Physical properties of minerals, 05: Optical properties of minerals, 06: Minerals: their classification and occurrence, 07: The silicate minerals, 08: The non-silicate minerals, 09: Mineral uses Section II - Crystals: 01: Introduction, 02: Elements of crystallography, 03: The six crystal systems, 04: Preliminary ideas on stereographic projection and x-ray crystallography Section III - Rocks: 01: Introduction, 02: Igneous rocks, 03: Sedimentary rocks, 04: Metamorphic rocks, 05: The rock cycle. Section IV - Ores: 01: Ore minerals, 02: Genesis of ore deposits, 03: Mineral deposits and global tectonics, 04: Indian mineral deposits, 05: Indian mineral industry: some facts and figures. 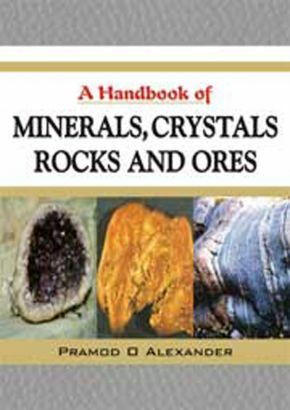 "An excellent textbook for those wishing to delve deeper into Geology. I have enjoyed reading it very much. I highly recommend this book. "